^^ Favorite Justin meme, ever. LOL! And, well, IT IS MAY! LOL! 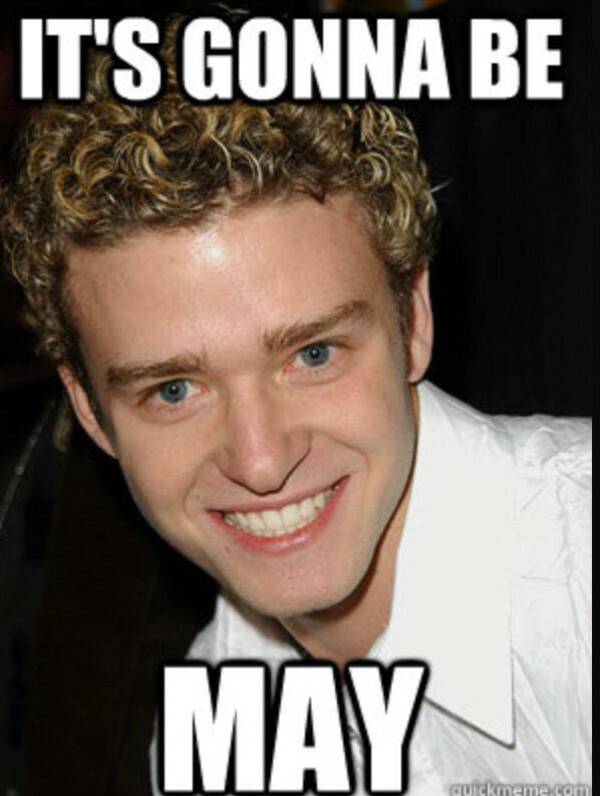 How is it already the beginning of May? Where has April gone? With the birth of my nephew, Finn, being hired *full time!!! * at a new school, and general end of the year excitement, it's been a (wonderful) whirlwind. Here's what's trending lately in Belle on Trend's world! [1.0] This skirt will make for endless effortless summer looks! The price point is something to smile about, too! I foresee tucking a white tee (as pictured) or any other pastel tee into this skirt for an extremely easy outfit! We hit up the Naperville Loft, but they didn't have my size in stock. I will be ordering online! It was lightweight and beautiful in person! [2.0] This bell-sleeve striped J. Crew dress. It comes in darker or lighter version. It runs a bit big! I was really surprised. I tried on the small, and it was too boxy. I went for the XS instead, and it was a perfect fit! Those sleeves are so much fun. Throw this on in the summer with your Jacks or some Toms wedges, and you're ready for the day! OMG! My bestie, Megan, is totally obsessed with all things pineapple. I told her she needs them for her honeymoon! There are even baby pineapple Jacks... looking at you, Amanda and Jackie! [4.0] I love this shirt from J. Crew! Paired with white jeans, this would be the perfect outfit for a summer night out when the temperatures dip down a little cooler, and you're going to be eating al fresco. I wrote about this a few months ago, but I found it on sale in Florida! It's such a beautiful, sophisticated dress. It was totally worth the 3-month wait! I wore it on an interview, to work and to lector at mass! The funny thing about this dress is it runs small. The six was a little tight, so I went for the 8. It is a perfect fit! There is also a blue version that is equally as gorgeous. I always stock up on winter-weight clothing in the spring because the deals are phenomenal. I got mine on sale for $75, but this sale comes out to about $60! Sorry for the selfies, lol! But you can also see this dress in motion on my Instagram page. There's a Boomerang of me dancing around in it after church. HAHA! Labels: J. Crew, Jack Rogers, Loft.